Yesterday I wrote about some of the challenges of publishing and the necessity to choose a different path. 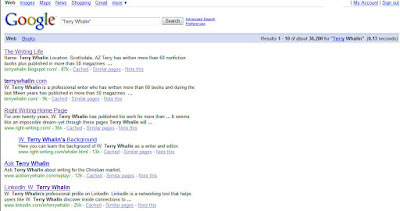 One of the great elements that levels some of the field for publishers whether large or small is the Internet. Whether you are much published or have never been published, what active steps are you taking each day to engage in this resource? In this post, I want to provide you with a resource to carefully read and study. 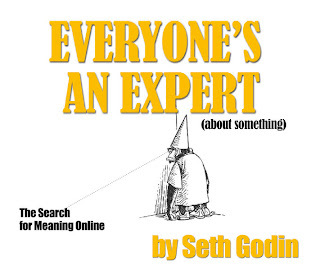 It's been out a couple of years from Seth Godin and is a free ebook, Everyone's An Expert (About Something), The Search for Meaning Online. If you scroll to the bottom of the link, you will see the PDF link for you to download, print and read. It took me about 15 to 20 minutes. It can take longer if you explore the various resources and links which Godin has built into this resource. You will notice in several different places that he addresses authors or people who want to be authors. It's another tool for building an active presence online. Often in our hurry-up, instant world, we are looking for some quick fix. I'm not sure that it's there. What is available to each of us is to consistently learn and grow in our craft, our understanding of the business of the publishing world (whatever part--fiction, nonfiction, books, magazine, newsletter or whatever). My strong suggestion for your writing life is to make a plan then work the plan. Enjoy (and learn) from this resource.